Lock in a great price for Pilgrimage Village Boutique Resort & Spa – rated 9.2 by recent guests! The entire staff made you feel welcome and attended to all our needs. This was the nicest and most expensive place we stayed on our whole trip. We only booked for one night just to tour Hue. It was a sanctuary at the end of three weeks of travel. We arrived by car in the afternoon and just stayed put until the next day. We had a lovely meal, massages, a swim. Our room overlooked the water lily pond. The room was large with a seating area and a balcony. The next day after a breakfast buffet, we checked out and then took their shuttle to visit Hue. The hotel was kind and let us store our bags as we were being picked up there later in the afternoon for a trip back to Hoi An. They even let us shower at the spa when we returned from sightseeing in about 95 degrees. Romela, , I believe a guest relations manager was extremely kind and helpful. Got upgraded right off the bat so that was nice, wonderful staff with a tranquil setting. Wonderful property, out of town and very quiet and serene. The spa is magnificent and all our meals were very good. This property was amazing and beyond what I expected to find in Hue. The grounds are expansive and lush and everyone provided excellent service. We had a honeymoon bungalow at the far end of the property that shared a pool with about ten other rooms and included access to a separate library room with a full afternoon tea. The room was one of the most spacious and luxurious I have ever enjoyed. It was a complete oasis of relaxation. The breakfast buffet had a great selection of local and western foods including freshly squeezed vegetable/fruit juices, great coffee and delicious pho. It is a bit out of the center of the city -- but that wasn't a negative for us. All meals were amazing. My massage was superb. The efficiency of the staff and their knowledge was wonderful. Transportation was simple and friendly. I give this place 5 stars! It was lovely. Friendly staff went out of their way. Beautiful pool. A way from hustle of donetown, but not too far. Free shuttle bus. Very good value. Well worth it. Amenities and service in the structure were very good,. They offer yoga lessons, tea service and there is a big swimmingpool. Since the hotel is not close to the center, they offer a bus transfer you can book to reach the city. Great hospitality, they even arranged a small present for my girlfriend's birthday. Loved the spacious pools, spa treatments and delicious breakfast. Good feeling during the stay there. The resort was quiet and natural with lots of trees. The facilities is well decorated also. There is a really nice swimming pool which is long and water is clean. All the staffs are polite. Breakfast is delicious. Pilgrimage Village Boutique Resort & Spa This rating is a reflection of how the property compares to the industry standard when it comes to price, facilities and services available. It's based on a self-evaluation by the property. Use this rating to help choose your stay! One of our top picks in Hue.Pilgrimage Village Boutique Resort & Spa is a rustic resort in a secluded area of Thua Thien Hue. It offers authentic Vietnamese culture and hospitality, extensive spa treatments, and different onsite bars and restaurants. From the property, guests can take the complimentary shuttle bus into Hue. Nearby attractions include tombs of Khai Dinh, Tu Duc and Minh Mang. At Pilgrimage Village Boutique Resort & Spa guests can chose between beautifully furnished bungalows, huts, villas and houses that are all surrounded by natural green forest. Some units include private pools, a plunge pool, gardens, and a variety of free services. Guests can enjoy attending Vietnamese cooking classes, Tai Chi classes, or select from different tours available. Alternatively, the resort’s swimming pools and the spa offer many ways to relax. There are 2 restaurants, serving Vietnamese and international cuisine, and 3 bars that include a lounge. Transportation and tour service inquiries can be directed to the front desk and reservations office. When would you like to stay at Pilgrimage Village Boutique Resort & Spa? 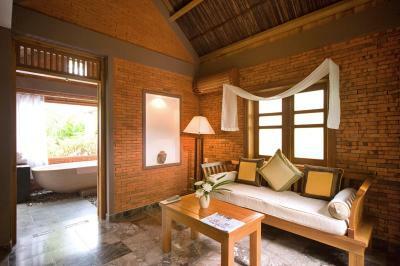 Room offers views of the surrounding lakes and garden, air conditioning and a private bathroom. Large bungalow features a high cathedral ceiling and wooden flooring. It comes with an open marble bathroom, spacious terrace, and lake views. - The Dress Code in the Candle Lounge is casual smart. - Public areas are nonsmoking. Featuring a separated gate and privacy fence surrounding the hut, room also offers a garden and private plunge pool. Featuring Hue traditional architecture, this house has its own gate, a swimming pool, and view of the lake. You will find a fully equipped kitchen and dining room. Private bathroom comes with a freestanding marble bathtub, as well as separate shower. This room consists of of 2 interconnecting rooms, each comes with a private balcony. It also offers views of the garden, air conditioning and an attached bathroom. This family room features a balcony, air conditioning and view of the garden and pool. Rooms are interconnected through a door. Contemporary room offers a private balcony, air conditioning, and private bathroom with bathtub and shower. Please note that this villa is for adults only (kids below 10 years old are not accepted). This pool access villa features a balcony, sofa and seating area. Rooms are 110 square yards. Pilgrimage Village is ideally located in the quiet countryside in rustic village setting surrounding by lush tranquil gardens, yet near to famous historical landmarks. The resort embodies the subtle connection of traditional stylish and modern art concept. Pilgrimage Village offers the harmony of soothing natural environment and local culture. Delicious meals, sound sleep, and the peaceful life of our quiet countryside combine to refresh your spirits and help to forget the troubles of life. House Rules Pilgrimage Village Boutique Resort & Spa takes special requests – add in the next step! Pilgrimage Village Boutique Resort &amp; Spa accepts these cards and reserves the right to temporarily hold an amount prior to arrival. Pilgrimage Village Boutique Resort & Spa accepts these cards and reserves the right to temporarily hold an amount prior to arrival. Please note maximum 1 child aged 4 to 9 years can be accommodated per room when using existing beds and will be charged according to hotel's policy. Second child (aged 4 years and above) is considered as an adult and will be charged separately for sofa bed. Please contact property directly for further information. A security deposit of VND 1,000,000 (or equivalent USD 50) per room per night is required upon arrival for incidentals. Debit or credit cards will be authorized and the authorization will hold the amount until check-out. The deposit is fully refundable upon the date of check-out and subject to a damage inspection of the accommodations. However, please note that the amount will be credited to your account within 2 to 4 weeks depending on your bank. - Staying date from 12 Jan 2019 - 22 Dec 2019. Room rates on 24 December 2019 and 31 December include a gala dinner. Extra guests will be charged separately. Nothing to dislike at all. For us it was a 5* hotel with a real wow factor, that said we do not usually treat ourselves to such luxury accommodation, someone more familiar to premium resorts may have a different review. Do be aware that there are a fair few critters about, plus the insects are noisy, however for us, that just added to the atmosphere! We booked this hotel knowing that we wanted to treat ourselves to something a bit special. It did not disappoint! Tucked away seemingly in the middle of nowhere, the moment you arrive you are treated like a VIP. The hotel grounds (especially the larger swimming pool) are stunning. The rooms themselves are very impressive. Very good location, cheap taxi into main centre or free shuttle bus. Treatments and trips through the Hotel SPA & front desk are most likely more expensive than if you sourced independently. Incredible place, you feel like you are in the jungle! An Amazing place with beautiful and peaceful surroundings, the most friendly staff, fantastic pool areas, and yoga and treatments. And the breakfast the best of all. Wish to come back some day. Nothing. It really was that good. Not in the town centre but a great place to stay and a good base for seeing all of Hue. Beautifully layed out hotel ,with everything you would want available, staff from check im to departure were wonderful! Very calm ! Everything , staff , facilities , food, we loved this resort . If we had one slight criticism it would be the cost of the fixed price buffet dinner which seemed just a little high. However this didn't diminish our overall view and we would certainly recommend this hotel highly. The rooms were great and the spa and swimming pools fantastic and it really made staying in Hue worthwhile. Friendly and attentive staff. Lovely pool. Beautiful spa. Room was very good value for money. Not a boutique hotel anymore, it is big now. We were staying in a brand new room, very comfortable, but the cement had barely dried up. Shower drain overflowed. Very good staff, manager Romelda is a delight. Very nice, fresh breakfast with variety of food, dishes you could choose from. The room was very specious with very comfortable beds and lovely clean bathroom. Beautiful surroundings with fantastic pool. Staff was very helpful. The resort is about 3 km from central Hué, and there isn’t much to see or do nearby - you’re dependent in taxis or a shuttle bus to get into town. The shuttle bus drops you in the main business centre, a good 25-30 minutes (very hot) walk from the famous citadel. We did a car tour to Bach Ma National Park, where we did some trekking in the jungle. Whilst it was enjoyable, some of the trek was quite challenging, and more so than we expected. Fortunately we had good walking shoes. Fuller information about tours at the point of booking would be a good idea. This hotel has a tranquil garden setting. It is away from the city centre but transport can easily be arranged plus they provide a free shuttle to and from that you can book. The staff are very friendly and helpful and our room was spacious and comfortable. Staff is very friendly. Restaurant is very good.